Any host can be clicked to be redirected to its ‘Host Details’ page, which is discussed below. Host Pools are logical groups of hosts that are described in detail in the “Network Interfaces” section of this document. This page show the list of defined and currently active Host Pools. A Chart icon to access historical pool traffic timeseries. Historical pool traffic charts must be enabled from the preferences page and are a feature that is only supported in the Professional version. 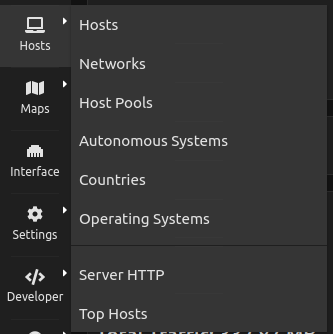 Host pools can be configured from the network interface page. Networks shows all networks discovered by ntopng. 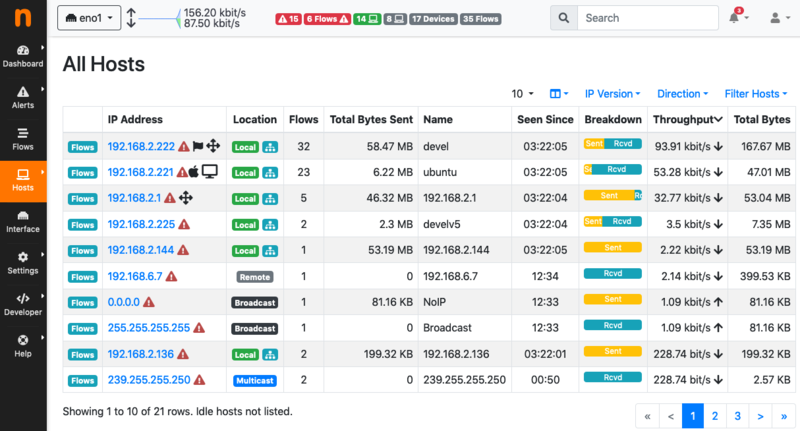 For each network discovered ntopng provides the number of hosts, alerts triggered, date of discovery, breakdown, throughput and traffic. Network names can be clicked to display the hosts lists inside the network selected. Autonomous Systems shows all autonomous systems discovered by ntopng. Ntopng uses a Maxmind database to gather information about Autonomous Systems (AS) and based on this it groups hosts belonging to the same AS. AS number 0 contains all hosts having private IP addresses. Countries page provides all countries discovered by ntopng. Any country can be clicked to be redirected to a page containing the full list of hosts localised in that country. Operating Systems page shows a list of all OS detected by ntopng. OSes can be clicked to see the detailed list of hosts. HTTP Servers page lists all local HTTP Servers. Multiple distinct virtual hosts may refer to the same HTTP server IP, which is specified in the second column. Additional information such as bytes sent and received are available for each HTTP virtual host. By clicking on the magnifying lens icon near to the HTTP virtual host, it is possible to display all active flows involving it. Top hosts page provides hosts activity on time basis. The page should be kept open in order to allow the graph to dynamical update itself with real-time freshly collected data for each host. The time axis is divided in 5-minute bars and goes backwards in time in a right-to-left fashion, starting from the present. The Hosts Geo Map page provides world map where hosts are arranged according to their geographical position. This page provides a tree map of all monitored hosts. By clicking on hosts it is possible to visit the corresponding ‘Host Details’ page. Local Hosts Active Flows Matrix page visualises a matrix of local hosts versus local hosts. Each cell contains the amount of traffic exchanged between every pair of hosts. Since flows are bi-directional, up to two values can be indicated in each cell.